This is an impressionist picture; as it was taken at a considerable distance with a hand held zoom. It can be compared to an impressionist painting that even the grass is a bit fuzzy. This is the animal that is used in many symbols, logos, emblems, statutes of many cultures and countries, for many centuries. There is a silence in the wilderness just before this animal appears. Many animals are so frightened and fled before or when the lion appears. He is the king of beasts; a symbol of strength and bravery. Picture taken by my wife in Namibia, Africa last month. This is the animal that is used in many symbols, logos, emblems, statutes of many cultures and countries, for many centuries . Picture taken by my wife in Namibia earlier this month. If you are interested in the Lion and the architecture around it, you may be interested in my next series on Rundale Palace. 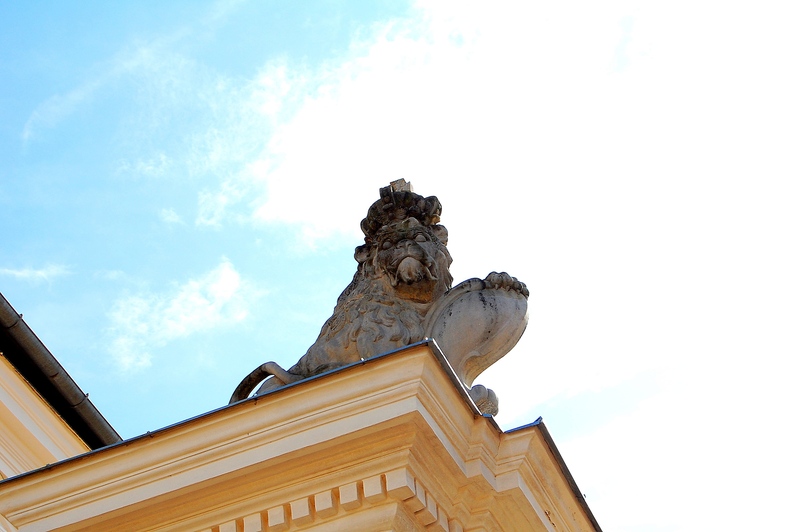 There are several lion statutes on top of the building and columns of this palace in Latvia. This lion looks a bit intimidating but at the same time interesting. The real treasures are inside the palace! Wild animals inspire us to think about the greatness of Nature. Lion is supposed to be the king of wild animals. We have been hearing about lions being killed in Africa. PS The picture was taken by my sister-in-law Jennie while travelling in Botswana. We didn’t see much in our trip to Longhu Shan because of the rain and the flood in the river. We came across the Temple of the Celestial Masters, with some impressive architecture. Near the main gate, we saw a pair of Lions. Never know whether medieval China has any lions as today this animal does not exist in the country. Here is a close up view of the face of the lion near the main gate of the temple. Also near the temple is this drum tower. Inside the temple we also saw this symbol of Ying Yang- I have never seen one in these colors. The trip was a bit of a disappointment!